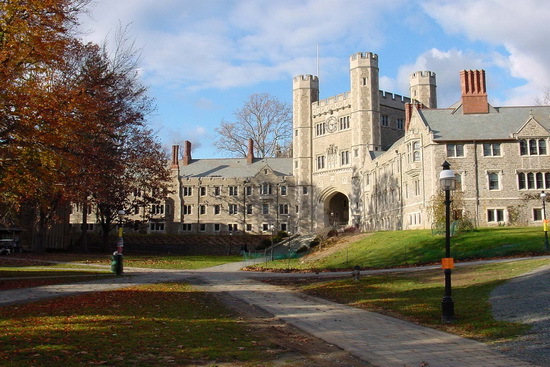 Princeton University is located at a distance of 70 kilometers from New York City and the same distance from Philadelphia, in a small quiet town of Princeton, New Jersey. The university was founded in 1746, what makes it one of the oldest educational institutions of America. Princeton was the first university to offer financial assistance in the form of grants to needy students (do not confuse with the credits). Princeton University is part of the Ivy League. In the 2014-2015 academic year at Princeton University teach 5200 undergraduate students and 2600 graduate students, with whom work more than 1100 professors. Among the famous alumni of Princeton University are many Nobel Prize winners, famous writers, mathematicians, economists and politicians, among which are the US presidents James Madison and Woodrow Wilson, Nobel Prize winner John Nash and writer Haruki Murakami. Students who graduated from Princeton, receive bachelor's or master's degree in the humanities, engineering, natural and social sciences. Total, one year of study at Princeton University will cost you $ 58965. This amount is huge, not only for foreign visitors, but for the average American, so there are a lot of loans and savings accounts, money that are deposited for decades. But, even with the required amount, it does not guarantee you will enter into this temple of knowledge. On average, study at Princeton University gets about 10% of applicants. What is the Ivy League? Eduzaurus is using Hatena Blog. Would you like to try it too?